3D printing is changing the way we build things—but what if the end-product can’t support its own weight until it’s finished? Scientists have developed a way to overcome that problem, by surrounding the whole thing with gel. This new 3D printing technique, developed by researchers from University of Florida in Gainesville, prints objects in an acrylic acid polymer gel that has the same consistency as hand sanitiser. A small needles deposits the material of choice — the team has used living cells, including human blood-vessel and canine kidney cells, so far — into the scaffold, where they can knit together. Usually, they’d just collapse in a sludgy heap. The team has used the technique to create some intricate shapes, and can create “spheres as thin as two sheets of paper and strands about 10 times thinner,” according to New Scientist. In fact, they’ve even used it to create a small replica of one of the researcher’s brain as a test of its intricacy. 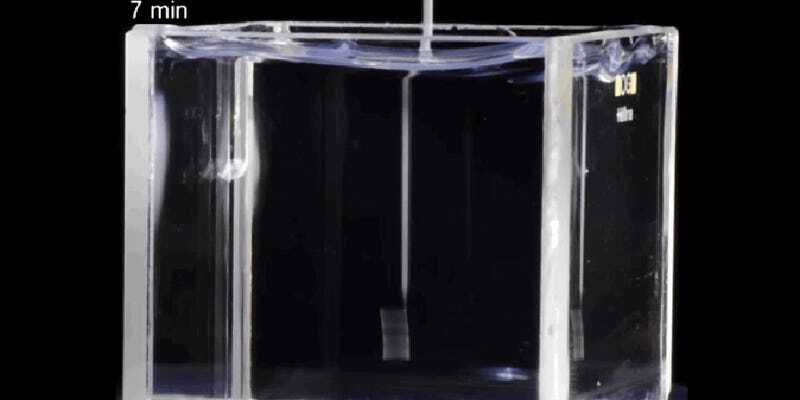 The technique is described in Science Advances. There’s one small hitch: the gel the team uses to support the structures isn’t organic, so it can’t keep the tissue alive while it’s printed. That’s a hurdle that obviously needs to be overcome before the technique is ever of use in printing real organs — something which is a long way off, but increasingly far from looking impossible.